A recent report published by Infinium Global Research on industrial protective footwear market provides in depth analysis of segments and sub-segments in global as well as regional industrial protective footwear market. The study also highlights the impact of drivers, restraints and macro indicators on the global and regional industrial protective footwear market over the short term as well as long term. The report is a comprehensive presentation of trends, forecast and dollar values of global industrial protective footwear market. According to report the global industrial protective footwear market is projected to grow at a CAGR of 6.1% over the forecast period of 2018-2024. Industrial protective footwear is a special type of footwear used in the industrial premises. Industrial protective footwear protects workers foot or leg while working, from falling object, electric shock, heated material and any unwanted injury to foot or leg. This footwear is effective in keeping the feet of industrial workers safe from sharp and heavy objects while working in factories. Industrial protective footwear is available in many styles, including sneakers and clogs. Protective footwear is fitted with toecaps designed to ensure protection against impact when tested at an energy level of at least 100 J and against compression when tested at a compression load of at least 10 kN. The implementation of stringent regulations for workplace safety, growing concerns among organizations regarding the benefits of safety gears, and development of global manufacturing industry are few of the factors helping to boost the growth of the industrial protective footwear market. Industrial protective footwear improves the safety of the workplace. Additionally, several industries such as mining, food, manufacturing, pharmaceuticals, transportation, construction, oil and gas, and chemicals are employing advanced protective footwear at their workplaces in a strict manner to reduce the human injury and financial loss to the organization. However, factors such as lack of awareness about protective footwear among workers in small and mid-sized industries in developing countries and growing preference of substandard protective footwear materials by several organizations are restraining the growth of this market in short and medium term. 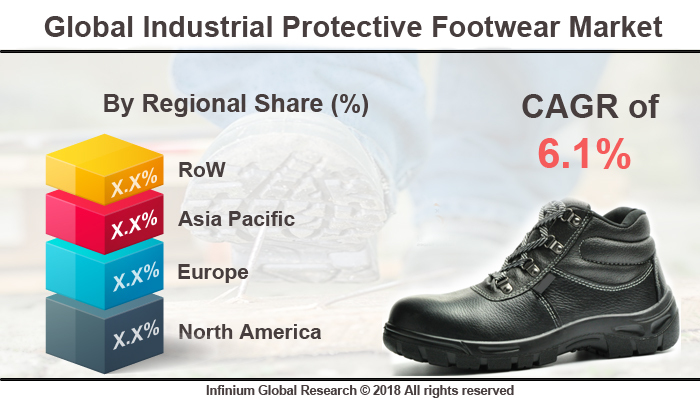 North America and Europe held the leading share in the global industrial protective footwear market due to the developed industrial sector, stringent government rules concerning the safety of human being and provision of financial compensation in case of injury to workers. Additionally, growth in demand for strong safety measure in working place by labor unions and implementation of a government initiative of workers safety measures in true spirit is expected to boost the market in the medium and long-term. North America and Europe held the leading share in the global industrial protective footwear market due to the developed industrial sector, stringent government rules concerning the safety of human being and provision of financial compensation in case of injury to workers. Furthermore, the Europe industrial footwear market is expected to grow over at a good CAGR in the coming years due to the presence of several shoe manufacturing firms in countries such as the U.K., Spain, Italy, France, and Germany. The increasing government regulations in Asia Pacific region regarding workplace safety is most likely to boost the demand for industrial protective footwear in the Asia Pacific region, especially in China and India. These regions are expected to boost the demand for protective footwear due to growing industrialization, the growth of the construction sector. Additionally, the growth of several industries as chemical, pharmaceutical, iron, and steel industries are helping to boost the demand for industrial protective footwear products in this region. The report on global industrial protective footwear market covers segments such as, type and application. On the basis of type the global industrial protective footwear market is categorized into leather footwear, waterproof footwear, rubber footwear and plastic footwear. On the basis of application the global industrial protective footwear market is categorized into construction, manufacturing, mining, oil and gas, chemical, food, pharmaceuticals and transport. The report provides profiles of the companies in the global industrial protective footwear market such as, JAL Group, COFRA, Dunlop Boots, Hewats Edinburgh, Honeywell Safety Products, Rahman Group, Rock Fall Ltd., Uvex Safety Group, VF Corporation and Wolverine. The report provides deep insights on demand forecasts, market trends and micro and macro indicators. In addition, this report provides insights on the factors that are driving and restraining the global industrial protective footwear market. Moreover, IGR-Growth Matrix analysis given in the report brings an insight on the investment areas that existing or new market players can consider. The report provides insights into the market using analytical tools such as Porter's five forces analysis and DRO analysis of industrial protective footwear market. Moreover, the study highlights current market trends and provides forecast from 2018-2024. We also have highlighted future trends in the industrial protective footwear market that will impact the demand during the forecast period. Moreover, the competitive analysis given in each regional market brings an insight on the market share of the leading players. This report will help manufacturers, suppliers and distributors of the industrial protective footwear market to understand the present and future trends in this market and formulate their strategies accordingly.